Hello and welcome to my blog so glad you are here! We had 2 days of 35 degree weather and now back to cold and snow. What a weather year for the record books for all of us! I am dreaming of the warm tropics and this digital stamp helped me out a bit! lol Maui Princess from Hannah Lynn is her name and what a beauty from Crafts and Me store. I took on this image because of Alyce Keegan from Kit and Clowder. She has a new site she just launched with classes and I am taking the one for skin and hair. I am learning to fine tune my skills and the more I practice I think I will get it! Just some really good down time for me to relax with while enjoying Alyce's instruction. You should go visit and sign up Here at her new site as she has more things going on than this!! She is colored in Copics and the Frantaged around. 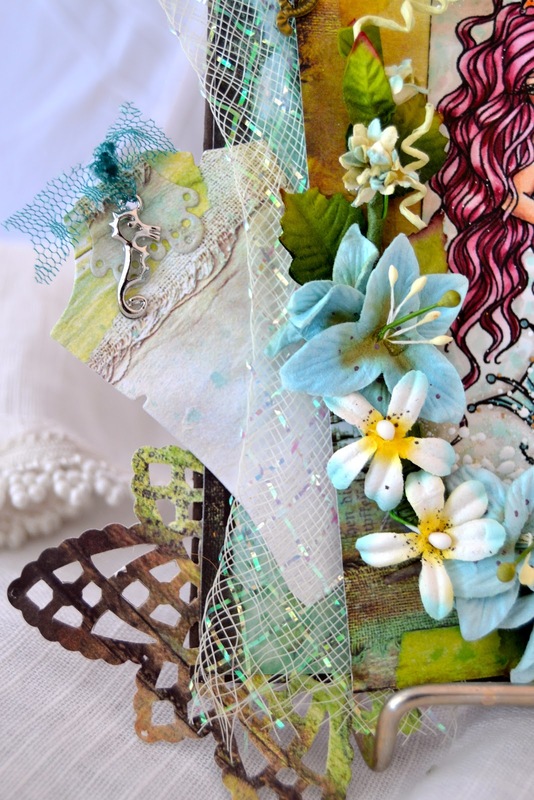 Here is the full card using papers from Anna Dabrowska, Dreamer. I used a old Spellbinders die for the corners. This one below reminds me of a fish tail. Tilda's tag has a seahorse charm and I left it blank as the inside has a sentiment already. I used a Prima Spray of flowers around the edge. The side view shows more of the dimension and dies. Thank you for stopping by my blog today, I truly appreciate your visits. 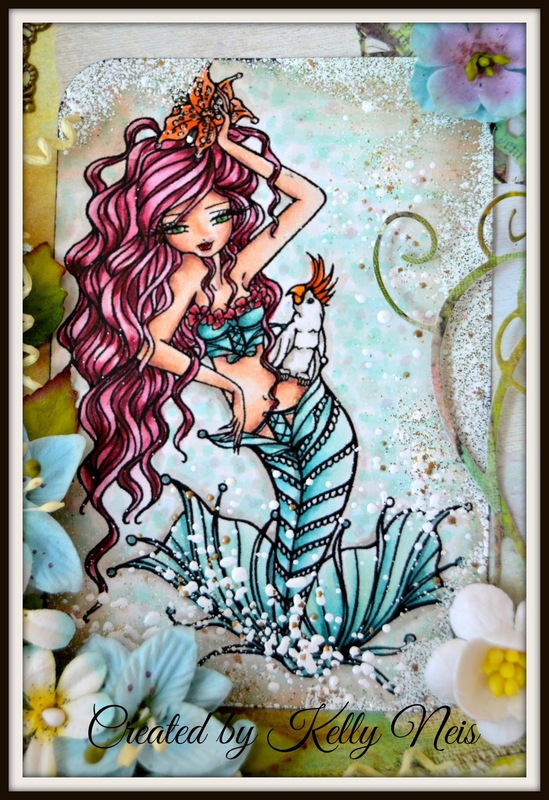 So very fanciful Kelly and your mermaid is so pretty and colored beautifully! Looking at this brings me to the beach! Your coloring is fabulous! 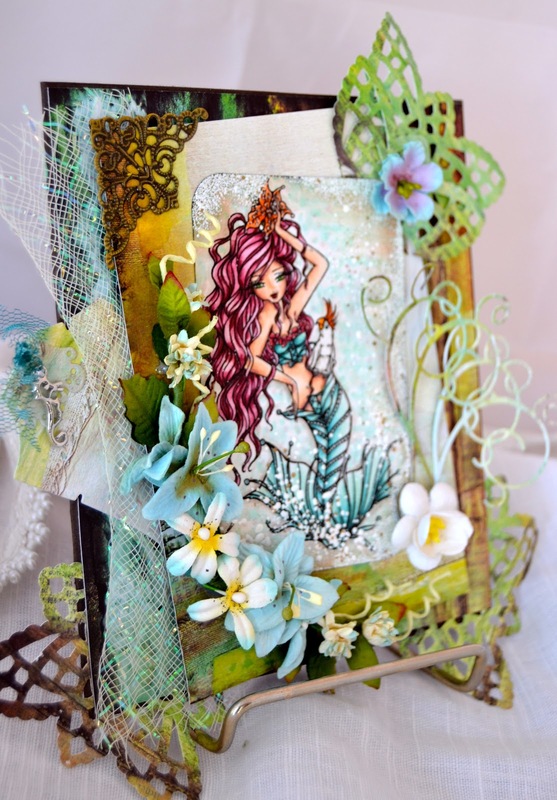 Fantastic design and all of your dies are wonderful! This image is stunning! Great work Kelly! Absolutely beautiful!!! I am ready for the beach! Don't be jealous, but we had a record breaking 75 degrees today! What??? But we had 12 inches of snow a week ago today!!!! Wow Kelly, awesome! weren't you scared to "frantage" the image? I am ... always afraid it won't give the result I want.. so I don't do it! I admire your courage, and you did beautifully! Love all the decorative elements. Your princess is colored to perfection. Fabulous job! Hugs. She's a stunner, Kelly - a truly magical creature, and the sparkly frantage water is amazing! Oh my goodness, Kelly!! I am drooling all over the place !! I saw your link on Facebook -- & had to pop over!! I'm learning so much from class, too!! Your card is simply amazing !! Love love love your way w: embellishments ! !